My sisters swear this is a "secret family recipe, but 3,000 pages with the same recipe are only a Google-click away, so either someone's given away our family "secret" or (*gasp*) we've been duped... Seriously I think this recipe, or variations, have been around forever. For the un-initiated "Almond Roca" is actually the Pacific Northwest's famous foil wrapped almond-and-chocolate covered buttercrunch toffee in the trademark pink can. These candies are insanely good, but sadly, every single variety is buttery, chocolate-y and so very un-vegan... as are the copycat "Poor Man's" recipes across the Internet. Preheat oven to 350. Line a jelly roll pan (cookie-sheet with edges - I always have people ask what this is) with foil and spray with cooking spray. Arrange crackers on foil to cover bottom of pan. In saucepan, melt coconut oil, margarine and sugar. Boil just for 2 minutes, then pour over crackers and quickly spread evenly to cover all crackers. Put in oven and bake for 7 - 10 minutes until light tan and bubbly. Remove from oven and immediately sprinkle chocolate chips over the cracker mixture. Wait a moment or two and chips will melt. Spread evenly with a spatula. Sprinkle with nuts and press nuts in to make them stick to chocolate. Cool in fridge until completely hard. Break into pieces. Try not to eat it all in one sitting. Keep extra (AS IF!!) in the fridge, it melts easily. sounds awesome but yeah I could probably eat a whole tray of them!! 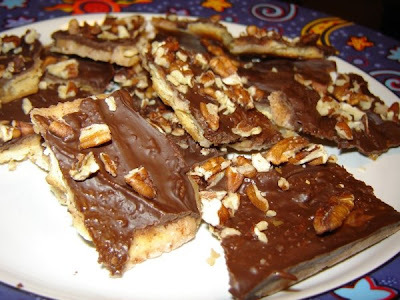 I've never heard of roca, but I've eaten something similar...chocolate melted on saltines with homemade toffee. I loved the way the saltiness combined with the chocolate. Best combo ever! Oh man, this sounds so so good. I could definitely eat that whole plate! Yummy. I have never heard of Almond Rocas, they sound as if they may be like Dime Bars with added cracker. Chocolate and saltiness is good. I remember the pleasure at children's parties of eating sweet buscuits with crisps.